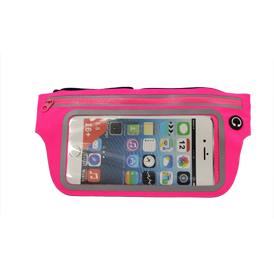 Waterproof materials keep your phone and valuables dry while you're out and about. Clear vinyl window allows phone functionality. 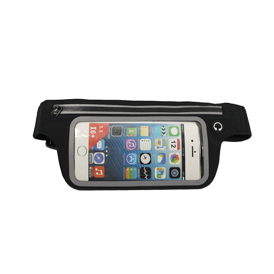 Inner phone pocket separates and protects phone from keys and valuables. Two size pockets fit most phones; smaller for up to 5" screens and larger for up to 6" screen phones. 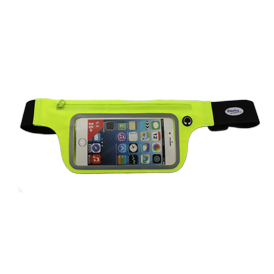 Safety reflective strips around phone window and zipper make this ideal for running/walking in low light. Redesigned for 2017. Woven imprint 1-3/8"W x 1-1/8"H sewn on strap. 2 design colors on background color. Each additional color is .14 (C) with 40.00 (G) set-up. Pocket colors: neon blue, neon pink, blue, neon lime green, and black. Adjustable black elastic strap 1-1/2" wide fits most. 20 lbs per 100 pieces.